For those after a stunning smile in little time, we also offer high-quality, custom dental veneers. 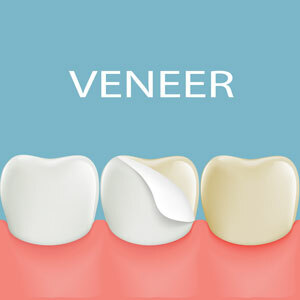 Our veneers are made from a thin porcelain material that is then bonded over the visible surfaces of your front teeth. This creates the illusion of a straighter, brighter, and more perfect smile, having the patient walk out of our practice feeling like a more confident version of themselves! Each veneer is custom-designed in a reputable, local dental lab. We also create a ‘wax-up’ of each patient’s veneers to show them first-hand how their veneers will look. These wax-ups represent the veneers’ proposed characteristics such as size, shape and colour. This initial stage of veneer treatment allows the patient to see how their results will look, even before their veneers are permanently fitted. When you choose to have veneers fitted at Green Apple Dental Clinic, you can be assured that you’re in highly-experienced, trusted hands. We aim to make the whole process as simple and relaxed as possible, answering any questions regarding treatment that you may have along the way. Dental veneers usually take a couple of appointments spanning two weeks to complete, including from the planning stage, right through to fitting. Once your wax-up model has been approved and teeth have been prepared, we’ll begin to make your permanent veneers. During this time, you’ll be fitted with temporary veneers to limit potential sensitivity and help you get used to how they will look and feel. As soon as your permanent porcelain restorations are back from the lab, we’ll bond them securely to the front of your teeth to ensure they last long-term. Although veneers are a long-lasting solution to achieving a more desired smile, they still require special care to ensure they remain in their best condition. To prevent the porcelain from chipping, we advise patients not to use their teeth for opening packaging or biting hard things such as ice. Despite porcelain veneers being stain-resistant, they can still collect surface stains over time (particularly from beverages such as tea, coffee, or red wine). Patients should care for their new smile the same way they would their natural teeth. This includes brushing and flossing regularly, as well as scheduling a check-up every six months. For patients experiencing teeth grinding or clenching, we can provide them with a protective bite splint to wear while they sleep. Unlike some dental practices, Green Apple Dental Clinic refuses to use cheaper overseas labs. Instead, we pride ourselves on working with Studio Dental Lab, one of the most reputable and high-quality labs based right here in the Melbourne CBD. By only choosing to work with expert dental labs you can trust, we ensure our results are the best in the business too. Are you considering veneers or wish to discuss this treatment with our expert team? Schedule a consultation today to find out how you can have the smile of your dreams within just two weeks!